Le PEZ is a way of investing in rural economy. The PEZ Zebu is our historic plan. the one with which all began. 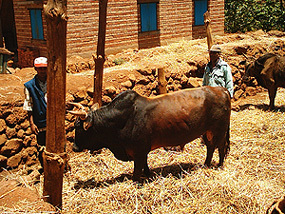 With your PEZ, we buy a zebu, chosen by a farmer, who repays with payments within its means. The repayment period is a maximum of 2 years. 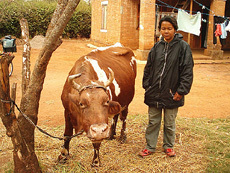 The zebu, animal symbolism here is primarily used to give manure, virtually the only source of fertilizer for malagasy farmers . 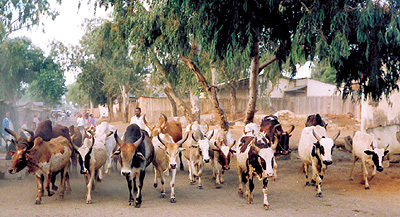 The male zebu is also used in the fields or to pull the cart. The female zebu is required for reproduction. Its 1 or 2 litres of milk per day are useful to the family but are not an important source of income: to make money with milk, farmers are asking us rather a hybrid or a dairy cow. Le PEZ Zébu: 300 euros. This is an animal strongly requested by farmers. A beautiful female mestizo can produce between 3 and 15 litres of milk per day. This is a good income source. The more the mestizo tends to cow, the more it gives milk ... But it is more expensive. The Mestizo are very popular with farmers because they give more milk than pure zebu and are more resistant than pure dairy cows. They are called here breeds improved. Depending on the prize, you are alone or several investors to finance a mestizo. 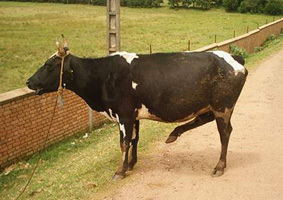 The dairy cows are animals that produce more provided peasant knows maintain them. As their price is high, we are asking for guarantees of skills and a stable worthy of the name. With more than 15 litres of milk per day, dairy cattle are a good source of regular income for farmers. We often advocate the peasants to learn farming with a zebu, then go on with a Mestizo as they have enough feed, and concludes with a dairy cow if they really want to become professional in the milk industry. 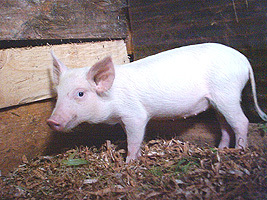 With your PEZ, we'll buy a little pink pig 2 or 4 months old, local breed or import (Large White ...). The pig is sold from 6 to 10 months to a family who will raise it. In general, farmers are asking us one male and one or two females for reproduction. Sometimes the request covers only a buck to fatten and sell it to slaughter after 6 months.